I simply can´t resist Jette Helleroe´s ceramics. Even not the lamps that - if you ask me right now - I´m never going to use for their intended purpose. They attract me in a way I simly have no amour against. And it´s a lovely feeling. You might know it. My plans are in some way to incorporate them in our garden design, but for now I want them close to me. At the terrace. In that way I can enjoy them even more often. Let my eyes rest on the beautiful ornamental flower patterns. One day I hope to know more about Jette Helleroe, than that she had her own studio in the northern part of Jutland, Denmark - in the town Lonstrup. And that she worked for both BR Ceramics and Axella Design. Everything comes in due time. 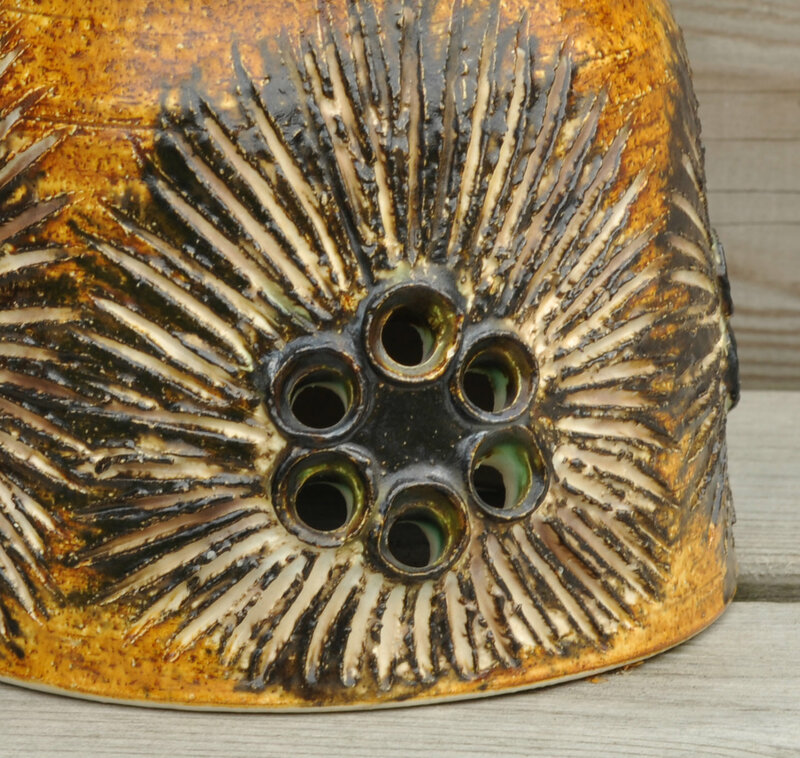 Meanwhile I´ll keep looking out for Jette Helleroe´s attracting pottery. I can see the appeal: they look like they came from the earth, and you can see the potters hand in them and it gives them a lot of energy. I would want to pick them up or at least run my hands over them all the time! oh Wow, they are beautiful....I haven't seen these Jette pieces before. I hope there soon will be more to see. It seems like they are coming in the thrift stores now. These two I´ve found this summer. Jeg kjenner følelsen:-)Fantastisk keramikk, Birgitte! Riktig flotte farver og mønstre- og nydelige bilder! !